Wild raspberries are ripening! There are many growing in and around the Palace of Nature, on the west side of WM II. Also, the serviceberries (aka juneberries, Amelancier spp.) planted last year are ripe. 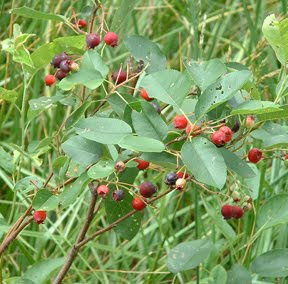 The ripe berries are purple, not red. Most have a single large seed. I hear that you can make a great-tasting jelly with these. Thanks to Mike Levine at Nature and Nurture for healthy stock and reliable advice.